Geeky comics – I really enjoy being able to bring both my geeky and illustration sides together. I always like a steam sale ^.^. Girl - Both shops and online retailers prepare for Black Friday record sales. Girl - Why does everyone go crazy over Black Friday? Why sleep outside a shop just to fight other people for a possible discount?! Now it’s online too! When will people realise it’s just marketing and mindless consumerism?! Guy - You found the Steam sale didn’t you? I know I haven’t posted in a while. I often note down comic ideas, but due to other projects & life, they don’t always materialise. But I’m very glad to be able to post this new comic which actually is the father’s day card I I gave my dad today! I hadn’t planned to post this as part of my comic, but I felt it would fit in well… and my family & husband kindly allowed me to post this publicly even if it is a little bit of a more personal piece. This was inspired cos recently my mum finally bought a smart phone leaving my dad as the last person in my intimidate family who doesn’t own some sort of smart device. He famously resists technology if his current technology works “fine”… maybe we can all learn from him by not be so ready to chuck our tech away… maybe =P. When I started this website, I didn’t want to feel obligated or tied down to any one style or to post all the time… I hoped it would be a bit like my illustration playground. At first I thought cos this piece was done in pencil that I shouldn’t post it, but I thought, why not, there are no rules here other than the ones I give myself =P. UPDATED 19-11-2015: Having said that I didn’t need to be confined to a style, i actually found time to redraw lolz. Here’s the original posted image. 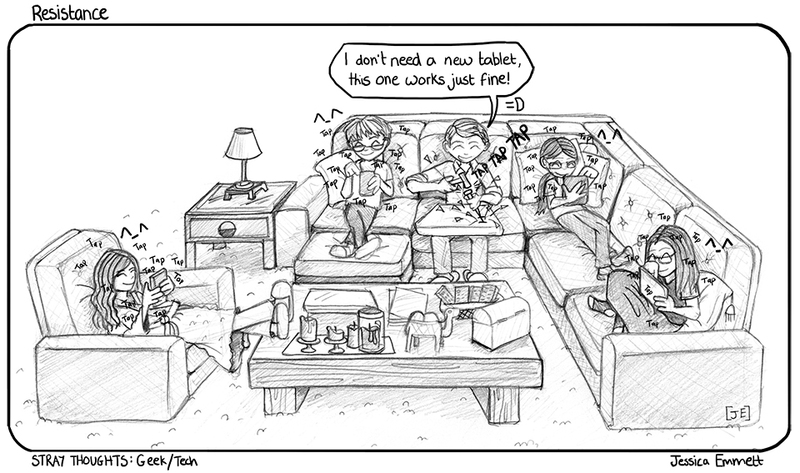 I don't need a new tablet, this one works just fine! I’ve had this conversation more than i’d like to admit. My poor husband at one point was a bit of a WoW widow. This was the first comic I did really for myself. At the time I didn’t think I’d be starting a new comic, but I needed to get this idea out. I have always embraced technology but have always been surprised how quickly other women and older generations put them selves down and think they can’t deal with technology. My message to everyone is be open to giving technology a go and you might surprise yourself on how much easier it it then you think… and if you get stuck don’t just give up, normally you can find the answers online =).